As one of my first ever blogs, I blogged about Moldova and the trip I had there last summer. Some of you will know that I am going back this summer (woop woop!) so instead of doing a boring plain talk to explain to church what I am doing and why I thought I’d do a video of last year to give them a flavour so here it is! It’s my first ever video so bear that in mind!! 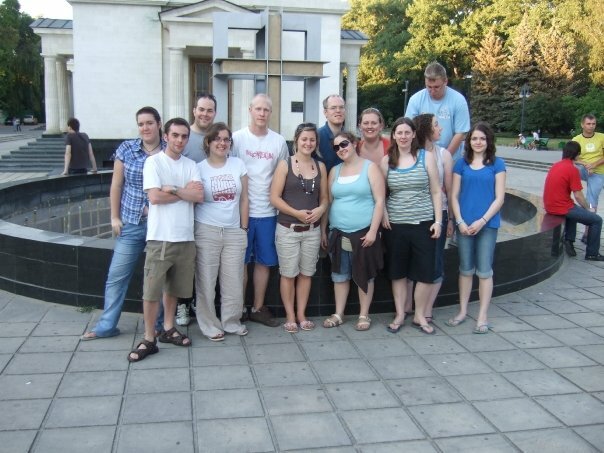 I’ve spent the first three weeks of July this year in Moldova with the UCCF North West Summer Mission Trip. It’s a trip I’ve heard a lot about for the last couple of years and really have wanted to go on but money, time and fear are big restrictors! This year though, I had the time and the other two didn’t seem like such big an issue so I signed up and went. Because I’d heard so much about Moldova and knew practically what happened pretty much, I hadn’t really thought about the trip that much in advance which meant that pretty much everything shocked me and I most definitely don’t think that I expected to learn so much about myself out there. The aim of our trip was to spend ten days on an evangelistic camp and it wasn’t until I got to the camp that I realised just what an awesome opportunity that really was. Here we had a camp where two thirds of them were not Christians and they had agreed to study the Bible with us for an hour every morning! I just can’t imagine anything like that happening in the UK which showed me just how different their culture really is. But then I got to wondering whether or not if I asked people would they want to study God’s word with me – challenge number one! Camp was a pretty humbling time for me over all. Being ill showed me that God is in control and although it was so frustrating not being able to go to the last Bible study, it really reminded me of who God was and who I was. And also, I realised how materialistic our culture is and how much I buy into that. When we were packing to leave camp, one of the girls in our room commented on my hiking bag that I was using, saying that it would have held all of her clothes. Quite humbling when I remembered that I’d been so proud of packing ‘lightly’ and that there was a pile of clothes on my bed at home that I’d been debating whether or not to taken as well as a wardrobe full of other clothes. My bible study group was such a highlight. All bar one, were Christian but very new Christians so being able to work through things like the cost of being a Chrisitian and what it practically means was fantastic, although I also realised that the cost that they are facing is so great with people thinking that they are part of a cult, Christians losing jobs, friends and family. Challenge number two – how much am I willing to risk for the gospel – when do I keep quiet when I should be standing up for it? Meeting the CSC (Moldovan UCCF) was amazing because they are our brothers and sisters and they share the same vision but also because so many of them could be living and working anywhere else in the world but they choose to stay because they love their country, the gospel and the students they work with. I think I’m very likely to write again about Moldova because it was so awesome but just wanted to share some of the challenges – it’s a reminder to myself that mission isn’t all about giving and doing things ourselves but remembering that God chooses to use us in his work – not vice versa!